Boss Jimmy Floyd Hasselbaink has hailed the unity shown between supporters and players during the Cobblers' crucial draw with Shrewsbury Town at a vibrant Sixfields - and declared the club is 'stronger together'. After weeks of criticism from sections of the fans at Sixfields over performances and team selection, and gripes from Hasselbaink about that negativity, everything seemed to be put to one side for the clash against the title-chasing Shrewsbury. It was noticeable on Tuesday that the Town supporters were intent on getting behind their team from the word go with lots of chanting and encouragement from the stands. The players in turn responded and produced a performance of heart, passion, energy and total commitment, things it could be argued have been missing from recent Sixfields displays. The only frustration on an encouraging night was that the team couldn't take all three points, but they did bag a crucial one in their quest for survival, and Hasselbaink was delighted with the crowd's enthusiasm and support. Asked if he felt there was a new sense of unity at Sixfields on Tuesday, Hasselbaink said: "Yes, and that that is what we need, because if that is the case then we are definitely a lot stronger together. "That is what I felt on Tuesday, and that was what was great about it. "It would have been so nice if we would have been able to get the three points because I think everybody deserved that around the place. It felt really good." The players were cheered off and given a standing ovation at full-time and half-time, with the one as the players headed down the tunnel at the break particularly rousing as it came just minutes after Shay Facey had fired the team into a 1-0 lead. And Hasselbaink says it is a feeling he is determined to make sure is experienced again in the club's remaining three home games this season, saying he can use it to motivate the players. 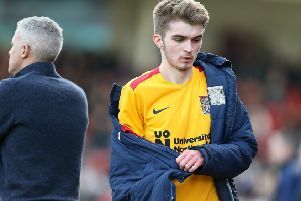 "It felt good to me, but for the players it is magnificent," said the Cobblers boss. "It is a big, big boost. "At least now I can say to them 'if you play like that, that is what you are going to get', and that is what they deserve. "It shows the minimum we need to do." The Cobblers travel to Fleetwood for a real crunch relegation clash on Saturday, before returning to Sixfields on Good Friday to take on Charlton Athletic, who on Thursday parted company with manager Karl Robinson. The Addicks have placed Lee Bowyer in caretaker charge. Bowyer, who began his playing career with Charlton before going on to play for Leeds United, Newcastle United and West Ham United, winning one England cap, had been assistant to Robinson since last year. Robinson was later unveiled as the new boss at Oxford United.